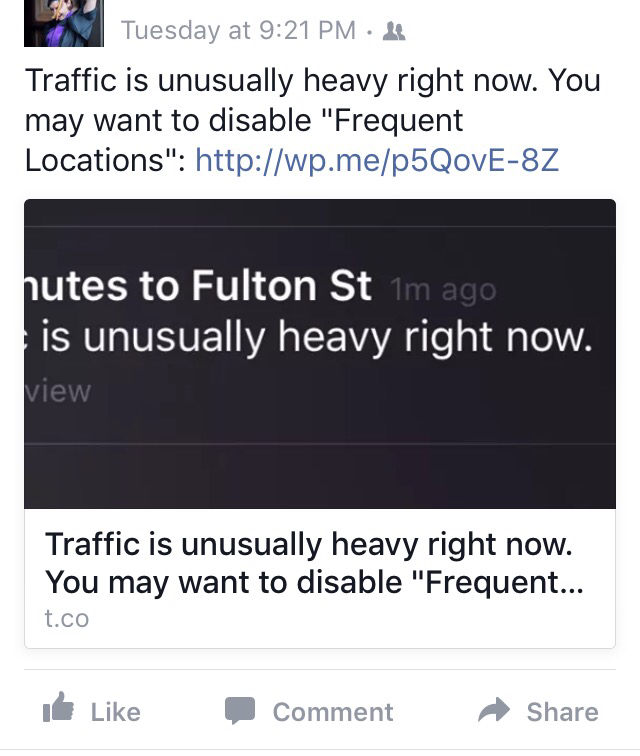 When I posted a link to my latest blog piece, Traffic is unusually heavy right now. 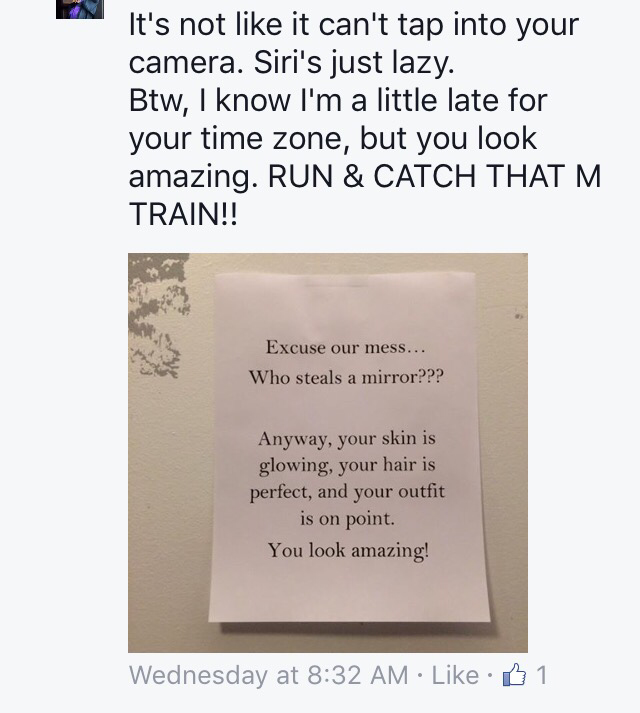 You may want to disable “Frequent Locations” to my Facebook page, a fantastically hilarious comment stream ensued. 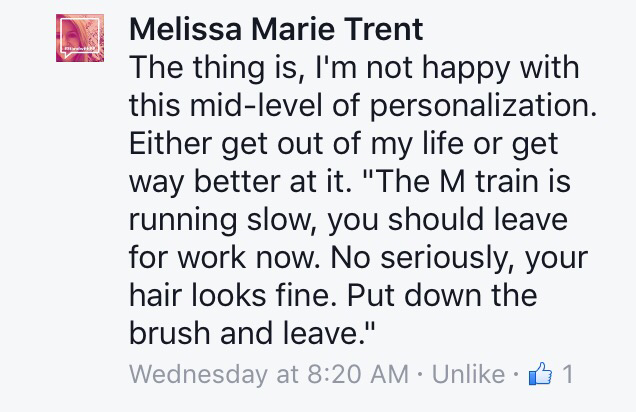 (Don’t worry, I got Ms. Melissa Trent’s consent before posting this). I pretty much died laughing. 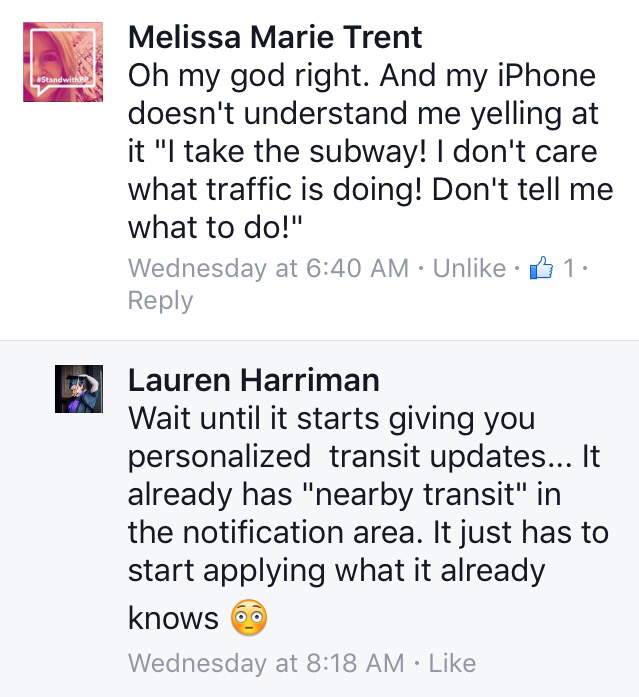 Note that, given iOS’s Frequent Locations feature that’s heavily discussed in the aforementioned blog post, there’s absolutely no reason Siri or iOS or “who”ever we want to blame (sorry guys, I’m just going to blame Siri) can’t automatically shift to giving you transit or even walking updates. The easy one of course is at least noticing that, on the regular, Melissa takes public transit. Her Frequent Locations already show that she’s going to the M train everyday around the same time. Though Next Destination is smart enough to work off of the “Next” Frequent Location, and gives traffic estimates based off of your location at the time of the notification, Siri is perfectly capable of noticing that, when Melissa is at her home (aka, another Frequent location), another set of data always corresponds to the path between Melissa’s home & her work: The M train. Since Siri already knows how to give general walking directions (see above), Siri can certainly manage incorporating walking directions into Next Destination in order to give “walking” notifications on a whole. Even if there was no notion of “walking traffic” (unless you work in downtown Manhattan, perhaps), Siri could at least automatically switch to provide walking estimate times when your current location is less than a mile away from your Next Destination. Siri knows that when you’re within a certain range of that Next Destination, you drive/walk/take public transit/sky dive. She knows when you were asleep, she knows when you woke up, and she knows what time you left one Frequent Location for your Next Destination. Ok maybe she doesn’t know that you jumped out of a plane to get there. But she knows the rest. She does. Accept it. Also accept that she’s too lazy to do you a solid. Seriously Siri. You’re Just Being Lazy. 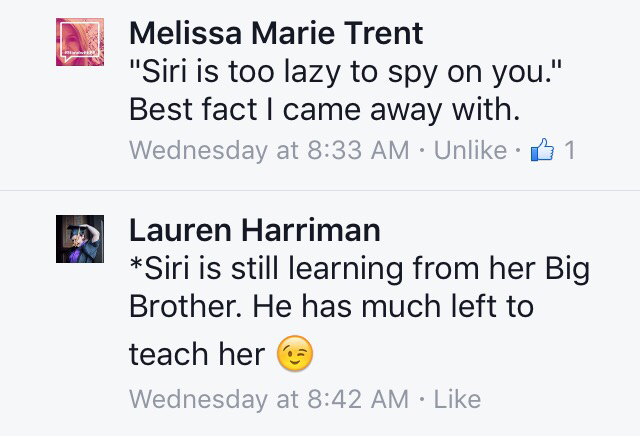 M: “Siri is too lazy to spy on you.” Best fact I came away with.